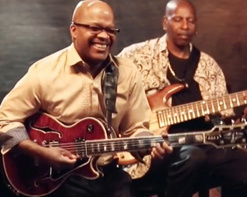 Jazz guitarist and vocalist Ed Sterling Stone has released a series of must-have music albums. Stone’s musical career began in Seattle, Washington, and later took him to Detroit, Michigan, which is the place he now calls home. Ed’s turning point in music started at the age of eight when he watched The Beatles on TV. He also heard some of his father’s old jazz records which brought him to this genre. As a youth, Ed played guitar in numerous soul, orchestra, and jazz bands in high school and in local night clubs in Seattle Washington. After high school, he studied music in college but afterwards decided to enter medical school at Wright State University in Dayton, Ohio. Today, he seamlessly manages a private practice in the Metro Detroit area while pursuing his first love of music for which he has received many rave reviews. He lives by one rule of thumb to make it all possible and this rule is careful planning. Karvin Johnson and the team at NMAP and KES Music and Video Distribution, our mid-west partners, present another winning clip, and we’re confident you and your viewers will embrace this engaging new video. For more information on this legendary artist, please contact Andy Gesner and the HIP Video Promo staff at (732)-613-1779 or email us at info@HIPVideoPromo.com. You can also visit www.EdSterlingStone.com or www.KESDistribution.com for more info on Ed Sterling Stone.